Yes, we live in a red state. When it comes to red meat, Nebraska has more beef on the hoof than any other state save Texas. And if you’re like most Americans, you’re still a meat-eater. Based on what’s been in the media for years now, it takes a certain amount of courage to eat red meat because “research” tells us that eating meat will kill us in a variety of ways. But what you never find out by reading all that research is that the kind of beef those researchers are talking about is the industrially produced, chemical-laced, antibiotic-ravaged and hormone-laden beef that is typical of commercial red meat. We never know what the researchers would’ve found out if they had used naturally raised, grass-finished, drug-free beef. But what we do know is that the beef that is produced from cattle raised and fed grass their entire life is a radically different food that has a nutritional profile far healthier than that of commercial beef. In the United States, there are basically two kinds of beef we can buy: The conventional version found at the supermarket or grass-fed beef that is raised with higher standards. The conventional beef found at the average American meat counter is the result of an industrialized factory process that packs thousands of head of cattle in confined animal feeding operations or CAFOs. (CAFOs are also used for pig and chicken production.) Though researchers don’t bother to specify, I believe that’s the kind of beef they are talking about. This assembly-line style of beef production allows antibiotics, drugs, growth hormones and genetically modified substances to promote the rapid weight gain needed to keep beef cheap enough to supply America’s hunger for red meat. Each cow is given a hormone implant forcing it to grow fatter faster. The conditions cattle are subjected to are stressful enough to require medication. Worst of all is the diet fed to these cattle. Most of the corn in the United States goes to feeding cattle and other livestock. Much of that is in the form of what is known as dried distillers’ grain or DDG. That’s the junk that is left at the very end of the ethanol production cycle. Industrial cattle aren’t even getting the best part of the corn but rather the crap that is left that would have been thrown away if someone hadn’t figured out that cattle will eat it. Despite the fact that these types of practices have caused countries around the world to ban the importation of American beef, that kind of beef is deemed safe by the United States Department of Agriculture. There is a second kind of beef (and chicken and pork, for that matter,) that is rapidly gaining in popularity in America. That kind of meat is from livestock raised in more natural ways. Prime to this type of natural method for beef cattle is raising them on a diet of grass. The label you should look for is “grass-fed.” And make sure it clearly states that the beef was never fed corn or grain. The reason it’s important is that cows are supposed to eat grass. Nature didn’t design them to eat grain. Only in the past 60 years or so have we been feeding corn to beef cattle. The reason industrial beef growers feed corn (and the junk byproducts) to cattle is to make them put on weight faster. It’s more cost-effective and convenient to feed processed cow food to cattle than it is to let them graze and eat their natural diet. The commercial cow food fed to conventional cattle is mostly grain-based. The problem with feeding grain to a ruminant is that it creates major health problems for the animal. Unhealthy animals require heroic efforts to keep them alive long enough to slaughter. Conventional cattle require medical interventions ranging from the moderate to the extreme. Even dairy cattle are fed a packaged grain-based diet. A ruminant has a four-chamber stomach. Grain in the first stomach will ferment and make the first chamber too acidic. If left untreated, a cow on a grain diet will simply die. The first step of treatment is much like you would treat a human with acid reflux: give some bicarbonate. Dairy cattle, for example, are given six to seven ounces of sodium bicarbonate every day to counteract the acid stomach. Then, as the acidosis gets worse, antibiotics are needed to keep the animal alive. Another problem with feeding grain to cattle is that since it is not their natural diet, it does not provide a natural balance of nutrients to the animal. 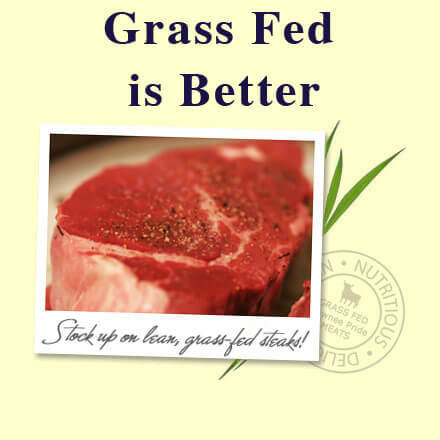 Meat from grain-fed beef has lower levels of nutrients than found in grass fed beef. Dr. Tilak Dhiman, former researcher at Utah State University, is a leading authority on the nutritional benefits of a grass-based diet for ruminants. Several years ago he delivered a lecture at the Nebraska Sustainable Agriculture Society conference in Norfolk. Dhiman’s research proves dramatic differences between conventional and grass-fed livestock when it comes to nutrient levels in the meat and the milk that humans consume. Grass-fed beef also does not require the use of controversial substances such as hormones, antibiotics and genetically modified organisms which end up in the food we eat. “We’re finding that things we know just by common sense are now being validated by scientific research such as Dr. Dhiman’s,” Rohrbaugh said. “It stands to reason that cattle that are treated humanely and allowed to graze on their natural habitat are going to be healthier than cattle confined in cramped pens and fed an unnatural diet.” That translates to healthier food for humans. In his nearly two-hour Powerpoint presentation, Dhiman emphasized the science behind the choice to raise livestock on a grass-fed diet. One of the first nutrient markers he studied was something called conjugated linoleic acid. CLA is one of those “good fats” you may have heard about. It is known to be a cancer-fighting nutrient, lowers body fat, fights heart disease and helps build bones. Grass-fed beef has three times as much CLA. Dhiman’s research also found that grass-fed beef has 300 percent more vitamin E, 75 percent more of those important omega-3 fatty acids, 78 percent more Beta carotene and 400 percent more vitamin A than grain-fed beef. All of those are important nutrients that result from a cow eating its natural diet. Grass-fed has more protein and less fat. And the fat that it does have is better for you. E. coli contamination causes 60 or so fatalities in the United States each year. It bears noting that the cause of that specific disease is traced to the practice of feeding grain to cattle. Grass-fed beef is far less likely to harbor the bacteria. That means your veggies would be less likely to be contaminated. Just as the labels “organic” and “cage-free” have been co-opted by the commercial food industry, the term “grass-fed” can be also. Beware of beef labeled “grass-fed” that was fed grass most of its life then finished on corn in the conventional manner. The nutritional advantages are lost within three days, according to Dhiman. True grass-fed means cattle that are put out to pasture to graze on deep-rooted grasses, not a grass supplement. Another reason to know your farmer. So when you read yet another article about how eating beef will kill you, take it with a grain of salt — the only grains that should ever be used with beef.